The program that is very important and provides many benefits for Education, Government, Company, and General is Microsoft Office or MS Office. Users of Windows PCs such as workers, students, and entrepreneurs must need an Office Program. Used to make documents, letters, percentage files, agendas, databases, data sheets and so on. Microsoft Office is very useful in resolving the interests of the Company. Even in the world of Education also in making various School Tasks requiring Office Programs. In MS Office there are various programs such as Word, Excel, Access, Power Points, Publisher, Outlook, Path Info, and so on. Each program has a different function so don't use it incorrectly. When installing Office you don't need to manually install one by one, because the Package has become one. In the package contains many programs that can be used, this time Next Siooon will discuss and provide information about some of the programs that are in Office complete with their functions. Besides that it has been sorted by the most widely used. The most widely used application, Microsoft Word or MS Office Word is a word processing software. Such as letters, articles, or other documents. Word is used a lot from starting school children, students, employees, and so on. Microsoft's features are very complete and easy to use, to make various types of documents with lines, graphics, images, colors, all in Word. This program is widely used in Education (School), Government, up to the Company, various archives, documents, letters, school assignments, papers, proposals, scripts, thesis using Word in the making. Official letters are even made using the Word Program available in Office. This application is used to process data quickly, equipped with graph tools, diagrams, and formulas used to calculate data. Thousands of data can be calculated quickly using Excel, with tables that can be easily arranged. Widely used to analyze and calculate data easily quickly. Many schools or universities teach Excel because it is very useful in processing data quickly. Thousands to millions of data can be processed and calculated quickly using Excel. There are also many Mathematics sciences available in Excel with simpler and faster calculations. Next is files that are used for Presentations. In this application there are many features that are used to make the appearance of each slide interesting. Starting from effects, writing, animation, sound, video, can be added to the Display Percentage interesting. In the world of Education many school students use Power Point to make Slide Presentations with the look and easy way to use them. Power Point is also used by many companies as materials in meetings or meetings. Access is an Office application, such as Visual Basic or Delphi. The database is used for large amounts of data. Other than that, it can be used as a Sales Form, Purchase Form, Employee Data Form, and so on. Creating a Database in Access is easier than other software. Databases on Access can also be linked to various Software Programs such as Visual Basic, Borland Delphi, many of which are also used in storing company data, sales data, up to buyer data. Maybe everyone uses this application, but please note that Microsoft Outlook is used to manage Outlook Email. This is easy to use for users to receive, read incoming emails or send emails. But not only that in Outlook there are also work schedules, calendars, journals and notes. Publisher is used to make newspapers, greeting cards, desktop publishing, and various other interesting designs. Microsoft makes it easy to design, this makes it easier for users to design Greeting Cards. Usually Visio is made separate from Office, but the latest Office series is visio into one in Office. Application commonly used to create diagrams, flowcharts, network schemes, and brainstorms. This application utilizes vector graphics to make diagrams. How to use it very easily just drag and drop it. This application is an XML base. The Info Path can be configured and used on the Website. Easy for users to create a form. This is a Microsoft application that was previously named Office Communicator 2007 R2. Lync is used to make it easier for users to manage incoming messages from various applications such as MSN Messenger and Google Talk, Skype, and Yahoo Messenger. The One Note application can be used for people who are looking for inspiration, used to scribble, insert objects, make irregular images. With this application users can create an idea or design. Because the function is like a blank paper that can be written freely. 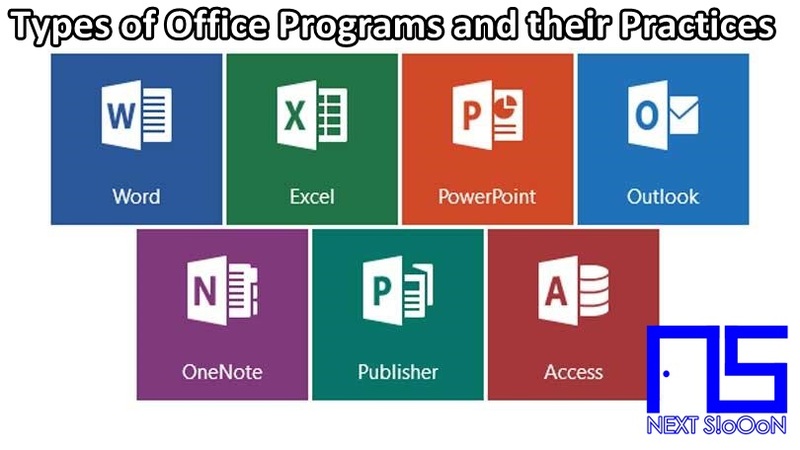 That is information about some Office Programs based on their functions, hopefully useful. Thank you for visiting Next Siooon. Keyword: Section Microsoft Office All Applications, Definition of Section Microsoft Office All Applications, Explanation of Section Microsoft Office All Applications, Functions of Section Microsoft Office All Applications, What are Section Microsoft Office All Applications, Understanding Section Microsoft Office All Applications, Regarding Microsoft Office Section All Applications, Functions and Benefits Each Section of Microsoft Office All Applications, Every Section of Microsoft Office All Applications, Information for Each Section of Microsoft Office All Applications, Detail Info Each Section of Microsoft Office All Applications, Types of Office Programs and their Practices, Information About Types of Office Programs and their Practices on Next Siooon, Info Detail Types of Office Programs and their Practices on www.next-siooon.com, Get Information About Office www.next-siooon.com, Get Know About Office Word Excel Power Point Outlook Access on www.next-siooon.com.